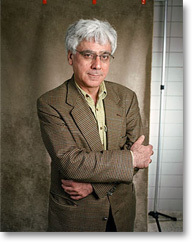 Sari Nusseibeh is the President of Al-Quds University, the only Arab university in Jerusalem. He is also a professor of philosophy. He co-founded The People's Voice, an Israeli-Palestinian grass-roots organization which advocates peace between Israel and Palestine. In 2001 and 2002, he was the chief representative of the PLO in Jerusalem, advocating a two-state solution to the Israel-Palestine conflict. He is the author of Once Upon a Country: A Palestinian Life. He lives in Jerusalem.